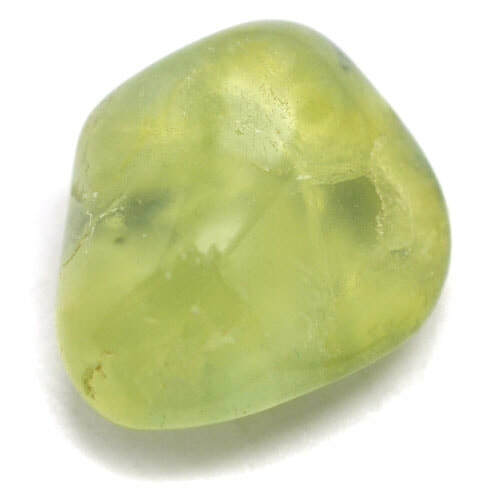 Peridot is the trade name for the gem quality mineral Olivine. It is a magnesium iron silicate that belongs to the Olivine group of minerals. The colours of this mineral is varying shades of green, from yellow-green through green to a green-yellow. It is translucent to transparent with a vitreous lustre. The crystal structure is flattened tabular to box shaped crystals. Peridot is found in Egypt, Myanmar, Pakistan, Brazil, Germany, Mexico, Ethiopia, Australia and the USA. The best quality peridot has historically come either from Myanmar or Egypt. But new sources in Pakistan are challenging that claim with some exceptional specimens. Possibly the most unusual peridot is that which comes from iron-nickel meteorites called pallasites. 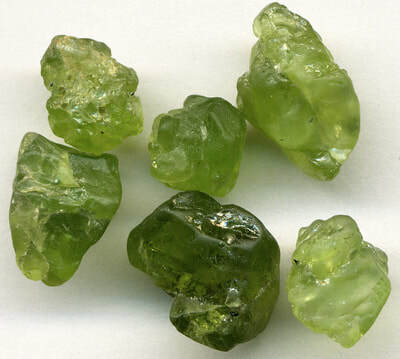 Peridot helps to activate and harmonise the Solar Plexus and Heart chakras, creating an integration of Love and Will. This stone can assist you in having the courage to act out your heart’s desires, to be generous to others, even as you pursue your individual destiny. Peridot has a strong detoxifying effect and stimulates the liver. It enhances the function of the liver and gallbladder, stimulates the metabolism and helps with skin problems, even warts. Peridot will increase the effectiveness of medications and treatments. This stone enhances the healing of ulcers, stings and bites that cause an allergic reaction, asthma, digestive disorders, the colon, pancreas, eyesight, gastroenteritis, IBS, Crohn's disease, breasts, assists in weight gain. Peridot will assist in stimulating overdue labour, relieve swelling and unwanted growths of any kind. Olive coloured peridot supports the proper assimilation of nutrients from food, drink, water and light. Peridot can be used to alleviate heaviness of heart and all manner of heart related imbalances. It helps strengthen the blood and can be used to counter anaemia and poor oxygenation. It is an excellent stone to use in recovery from tobacco or inhalant addiction. ​Peridot balances bipolar disorder and overcomes hypochondria. Peridot dissolves oppressive feelings that arise from self blame and a bad conscious. It helps with stored up anger and fury. ​Peridot guards against destructive jealousy that is caused by betrayal in past relationships and personal fears that you are unlovable, rather than relating to the present relationship. Peridot is helpful for transforming negative emotions like self sabotage, jealousy, agitation, and impatience into lighter emotions such as love, compassion, acceptance and gratitude. It is also beneficial to assist you in digesting life; accepting your world as it is and then transforming it with clear intention to create the reality you wish. 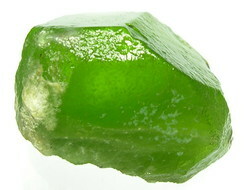 Peridot helps remove blockages to receiving. Many spiritual people are adept at giving of their love, time and energy, but may not be so good at receiving. Blockages are often located at the back of the chakras and exist as clouds within the emotional body. Peridot can assist in dissipating these blockages and teaching you how to receive with grace and gratitude. Peridot helps you to admit your mistakes and to forgive yourself. It makes you aware of things you have neglected to do and stimulates you to make up for the damage caused. Peridot is beneficial when you are going through a rite of passage or ritual. This stone helps you transcend any challenge presented through inner strength, connection to higher realms of consciousness and divine will. 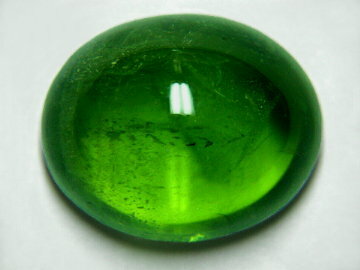 Peridot also assists you in thinking outside the box by opening your mind to unlimited possibilities. Peridot sharpens the mind and opens it to new levels of awareness. Peridot will help you take responsibility for your own life, especially when you believe that it is all "someone else's fault" rather than your own. It helps you look back at you past and find the life gifts that you have received. Peridot helps you with psychological clarity an well-being. Peridot will help you detach from outside influences. It helps you live your own life and to cull some wisdom from the abundance of experience. ​Peridot is a stone of transformation that helps you rise above addictions. Even more importantly, peridot serves as your guide as you facilitate healing processes that assist others going through what yo have already overcome. This is the stone of the "wounded healer". Use it as a tool to increase the benefits of Reiki sessions. Peridot is ideal to gain assistance from Archangels Sabrael and Zadkiel. Peridot assists you in perceiving and honouring the source of all abundance. This source is the Creator’s frequency of Love. By opening yourself to receive more of this Universal Love, peridot can help you receive abundance in all levels life. It also teaches the knowledge of other-Earthly realms, including the fairy realm. It is useful in connecting and communicating with other Earth beings, such as the plant and animal kingdoms. It is a wonderful stone to use in animal communication and healing. ​Peridot helps you understand your destiny and your spiritual purpose.